Anyone interested in covering hammocktime on their blog, magazine or newspaper is invited to download our media release [PDF]. For interviews, please contact Fee Plumley, fee@technoevangelist.net. All of the photographs on Flickr (linked to below) are licensed CC-BY; they may be used for any purpose without requesting permission. Dec 2nd 2015: The Advertiser – “Former Z Ward at Glenside among new Fringe venues set to spread the madness” by Patrick McDonald. Feb 12th 2016: InDaily – “InDaily’s 2016 Adelaide Fringe picks” by Suzy Keen. Feb 16th 2016: Rip It Up – “Your Guide To Adelaide’s Fringe Hubs (and the crowds who love them)” by Walter Marsh. Or perhaps you just heard that this Gluttony is hosting a show called Hammocktime this year and are in desperate need of some sweet hammocky reflection. Feb 16th 2016: “Adelaide Fringe boasts an appeal second only to Edinburgh” by Verity Edwards. Feb 23rd 2016: Aspire Magazine – “Time out or freak out – Here are 9 weird and wonderful Adelaide Fringe Picks” by Sky Harrison. Hammocktime is just what it sounds like – time out in a hammock, nestled among trees at Gluttony. Comes with a personal guide to help you with the drifting off part. Feb 23rd 2016: The Advertiser – “Daily Diary: All the Adelaide Fringe 2016 shows to see“. Traveller – “Fringe Adelaide 2016 is Beyond risqué” by Katrina Lobley. 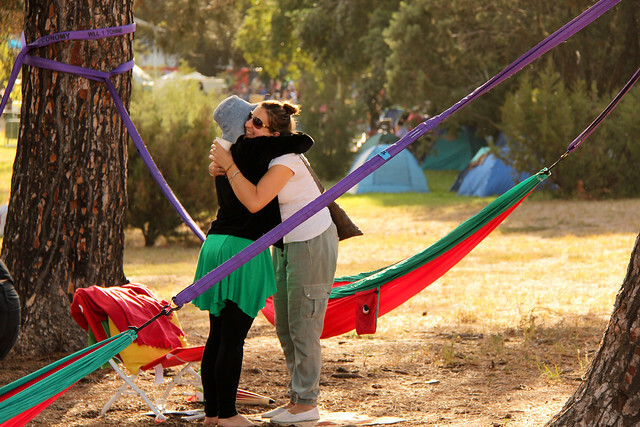 When it all gets too much, visitors can head over to Gluttony – another festival hub across the road from the Garden of Unearthly Delights – for 20 minutes of live-art performance called hammocktime (which does involve lying in a hammock). Lipmag: “festival review: WOMADelaide” by Lou Heinrich. Under the yawning trunks of tall pines, four hammocks are stretched between poles. I climb into one, unsure of how it will take my weight, and my meditation guide, Manal, sits next to me. She offers me a blanket and a pillow. I feel safe. Like the other meditation guides (one to each meditator), Manal is a spoken word poet and her voice is round and calm as I relax my body into the hammock’s gentle swing. Between each question, she leaves space. Space for me to breathe, space to search the eternal pines, space to listen to the truth beyond the noise. After ten minutes of cool whispers, I am left to my own thoughts, and I feel my body in the hammock, cool air sweeping my skin through the thin material. I breathe in unison with the trees around me. I am centred. After, I walk the grounds of WOMAD with a quiet heart and an inside smile.